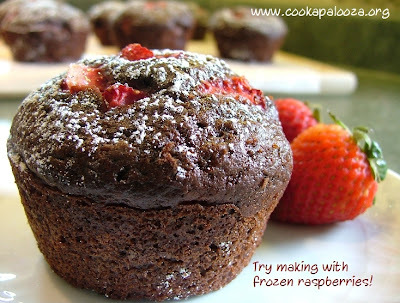 The Cook-a-Palooza Experience: Strawberry Chocolate Muffins - Breakfast, Snack or Low-Fat Dessert? Strawberry Chocolate Muffins - Breakfast, Snack or Low-Fat Dessert? It hasn’t rained here in Oakville for weeks. The temperature is stupid hot and the humidity is in ridiculous territory! Yesterday I made things even hotter in my house by baking muffins. Not one of my better ideas. In my defense…I couldn’t help it. I was flipping through a cookbook called The Athlete’s’ Palate Cookbook and saw a recipe idea for Cherry Chocolate Muffins. Sounds good right?! The only thing I didn't like about the recipe was you had to pit cherries. Forget that! That's why I went with this strawberry version instead. I was sort of nervous making these because I used my own muffin formula and the batter looked like it was more for brownies than muffins. Thankfully when they came out of the oven 12 good looking muffins appeared! One thing I did follow from the recipe was cooking them in a 325 F oven for 18 minutes. I usually cook muffins at 350 but the lower temperature worked perfect! The inside of the muffins reminded me of a moist chocolate cake! Even though these may look like a waist expanding dessert they’re relatively low in fat. The hard part is having the will power not to reach for the second one after eating the first. Apparently I have little will power. Now I’m not too sure if I would eat one of these muffins for breakfast. However I did recently see a picture of pancakes drowning in chocolate sauce so I guess these muffins could qualify for breakfast food. But I think I’ll enjoy these more as my late afternoon snack! Spray muffin pan instead of using paper liners. Omit icing sugar. It's only for looks...they taste just as good without it! Spray a 12-cup standard-size muffin pan with non-stick spray. Set aside. In a large bowl combine flour, cocoa, sugar, baking powder, baking soda and salt. Set aside. In a medium bowl whisk together eggs, oil and yogurt. Add to dry ingredients and mix just until moistened. Gently fold in ½ cup of strawberries. Divide batter evenly among the 12 muffin pan cups. Top each with equal amounts of the remaining strawberries. Bake in a 325º F oven for 18 to 20 minutes or until a toothpick inserted in the center of a muffin comes out clean. Remove muffins from pan and let cool on a wire rack. Lightly sprinkle with icing sugar. Get access to MORE healthy recipes and ways to cook with LESS effort every other week via the newsletter! It's free when you subscribe! 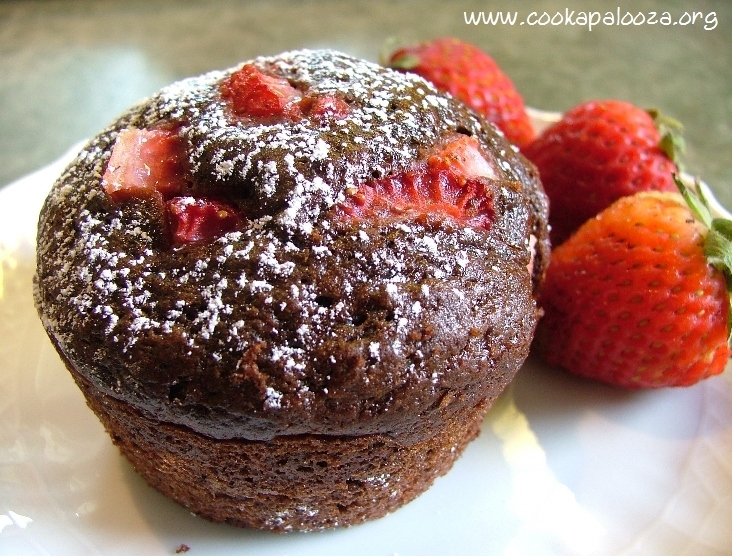 These were absolutely the best strawberry chocolate muffins I've ever baked! Thank you so much! My family loved them!!!!!! Moist with strawberry flavor and wow the chocolate finish was amazzzzing! Thanks so much for sharing your comment! Happy to hear they were a hit!